After a quick tour of the Cheong Fatt Tze Mansion, a beautiful and colorful (literally and figuratively) heritage house in the heart of Georgetown, A. and I decide to take a little side tour of the chocolate kind. Just a short stroll from the mansion is The Chocolate Boutique. Housed in a converted colonial home, the Chocolate Boutique is a mecca for any chocolate lover visiting Penang for the first time. Despite the fancy name, the ’boutique’ is less a chi-chi truffle shop and more of an austere retail outlet. But if you care less about looks and more about chocolate of any kind, this is the place for you. Rooms are filled with shelves of chocolate. There is chocolate for every palate: from the unadulterated (pure, bitter-sweet dark chocolate) to the exotic (durian and espresso beans) to the just plain weird (teas and chili). One chocolate confection really captured my eye and my tastebuds — The Green Tea Almond. The idea is fairly simple. 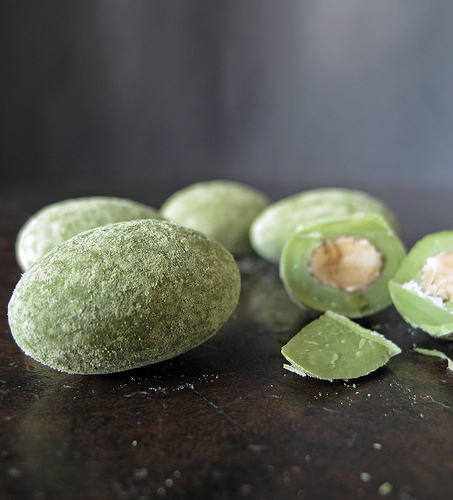 An roasted almond is encased in a layer of green tea-infused white chocolate. Then it is covered in even more green tea–this time in powder form or Matcha. The end product is a little emerald-like gem of a chocolate. The milky sweetness of the white chocolate is coupled with the subtle bitter hum of the infused green tea and nutty almond, making a perfect balance. Every nibble is a soft creamy bite, immediately followed by a satisfying crunch. I don't think chocolate with chili is weird at all. Sugar and spice, as they say. In fact, I'm seeing that combination more and more often now. Xocolat has some chili-infused hot chocolate drinks, and Pazzo has a very spicy Mexican Chocolate flavor. Don't eat when you have a sore throat -- it made me cough repeatedly and I couldn't finish the scoop! Thank you, Bee. You and Jenny really made this trip an excellent experience. Thank you for the green tea almonds. I am not a huge green tea fan (I mean, it's alright but I wouldn't count it as a favorite), but I found 'em really interesting. Got better with every bite. And that is an awesome photo.